Zadi from the Videobloggers Group has set up a fun event for anyone that wants to participate. Halloween Vlogfest 2005! All you need to do is make your video and tag it HalloweenVlogfest2005. With my two boys and their cousins, I’ve got alot of content coming in between now and Halloween night, so I imagine I will be posting my video later in the evening of October 31st. Visit Zadi’s site, or search for the tag on your favorite engine(s) and site back and enjoy! Here is another serendipitous music video. This time, a really nice retail experience in the Back Bay area of Boston filmed while I was out for Paul Graham’s startupschool.org. 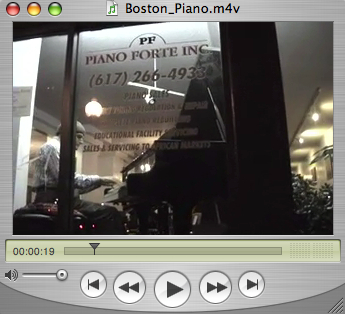 Special Thanks to Mark Seelig @ Piano Forte for allowing me to shoot. Wonderful. My first trip to Boston. Thank you for the credit, I’m having difficulty viewing the QT movie. Please suggest a fix.